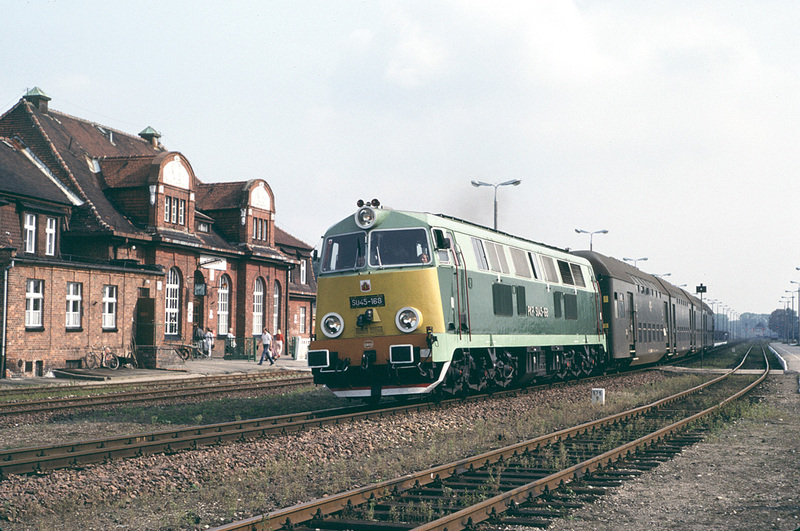 PKP (Polish State Railways) SU45 locomotive #168 starts a Bydgoszcz-Chojnice local passenger train from the station in Tuchola, Poland on a sunny 23 September 1993. The last SU45s were withdrawn from passenger service in 2016. The classic double-decker stock (Bhp) seen behind the locomotive is all but gone. A handful of sets still see summer-only use. Passenger service through Tuchola was transferred from PKP to Regional Railways (Prezewozy Regionalne), and then to the private operator Arriva. Today you will find only DMUs on this route. But memories of that warm late-summer day 23 years ago remain.